Armed with years of experience as a Hip-Hop producer, Headnodic brings ALL of his inuences to the studio for The Iguana. A full menu of styles from his years of crate digging are evident; jazz fusion, prog rock, Brazilian funk, psychedelic soul, and early electronic sounds. The result is exactly what the composer and producer intended – a musical time traveling exploration into the furthest reaches of rhythm and melody. 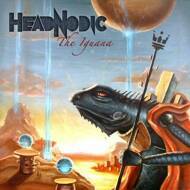 Headnodic manages to blend all of these inuences and styles into an aesthetically pleasing story that allows the listener space to listen intently or simply lay back and groove. The record was tracked with all live instruments (without samples) and features guitarist Tom Ayers (Persephone’s Bees) and percussionist Valentino Peeps (of Agua Libre), fellow Crown City Rockers Kat O1O (keys) and Max MacVeety (drums).